The FIFA World Cup trophy has landed in Dubai today as part of the global FIFA World Cup™ Trophy Tour by Coca-Cola. The arrival of the trophy was celebrated with an official launch ceremony at DXB International Airport in the presence of His Excellency Saeed Mohammed Hareb, Secretary General of Dubai Sports Council; Lucas Rachow, FIFA Marketing Partnership Manager; Victoria Lopyreva, official ambassador of the FIFA World Cup 2018 and Murat Ozgel, General Manager of The Coca-Cola Company Middle East. The trophy found an amazing home at the Dubai Frame upon its arrival, where it was placed in its centre for a spectacular shot showcasing the beauty of the frame, and capturing the Burj Khalifa, the tallest structure in the world, in the background. The moment brought together one of Dubai’s most recent and breath-taking landmarks and one of the most prestigious and iconic trophies in the world of sport. Consolidating the fact that tolerance is a value that is integral in both the FIFA World Cup Trophy and Dubai, the trophy then made an appearance at the recently inaugurated Tolerance Bridge. His excellency expressed his delight in the partnership between Dubai Sports Council and The Coca-Cola Company in hosting such a unique visit that is fitting to the position of the UAE in hosting sporting events; to the iconic trophy; and to the company’s partnership with FIFA. His excellency also confirmed that the trophy tour in Dubai will visit iconic landmarks in the emirate in celebration of this momentous experience and in appreciation of the value of the World Cup. 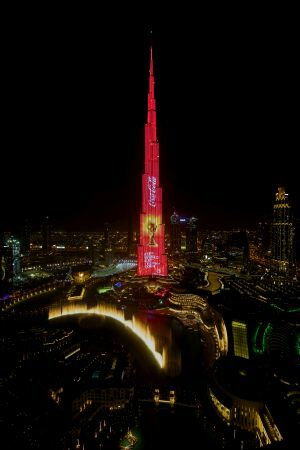 Marking its presence in the emirates; continuing Dubai’s legacy of being a pioneering novel city; and breaking a world record, the trophy was taken to Burj Khalifa’s 112th floor – marking the highest point on land the trophy has ever been. The tour ended with a gala dinner at the Armani Pavilion Downtown Dubai with numerous illustrious attendees including His Excellency Saeed Hareb, Secretary General of Dubai Sports Council, Murat Ozgel, General Manager of The Coca-Cola Company Middle East and Victoria Lopyreva, official ambassador of the FIFA World Cup 2018. Emphasizing the importance of the event, Murat Ozgel, General Manager of The Coca-Cola Company Middle East, said: “Football is one of the most popular games in the world, uniting global citizens of all walks of life in their shared passion and enthusiasm for the game. Coca-Cola shares that passion and, together with FIFA, we are proud to champion an event that brings nations together in a celebration of sporting prowess and a beautiful game. The FIFA World Cup Trophy Tour kicked off in September 2017 in Russia. During its journey across six continents, the trophy will travel a total of 126,000 kilometres in the months leading up to the 2018 FIFA World Cup. The global phase of the FIFA World Cup™ Trophy Tour kicked off in London, United Kingdom on January 22. The trophy will finish its world tour in Tokyo, Japan on April 30, and will return to Russia for a final tour of the host country in May 2018. The FIFA World Cup will run from June 14 to July 15, 2018.